So it seems Labour’s tantalising dalliance with Red Socialism didn’t last very long. At the beginning of the week the docile commentariat was agog at the prospect of Labour’s new found radicalism. They were, we were told ‘outflanking’ the SNP. Margaret Curran and George Foulkes were the Rosa Luxemburg and Zack de la Rocha of Scotland just ready to unleash a blast of old-school Marxist rage into the independence referendum debate. Indeed, Lamont could not have taken a harder socialist approach had she grabbed a red flag and waved it from the rooftop of the Scottish Parliament building. The words she kept using were ‘progressive’ and ‘redistributive’ but the message was clear – she intends to give the Scottish Parliament the power to hammer the rich, squeeze the middle classes and balance as many wealth inequalities as she can. This from the women whose only single contribution to the political debate during her tenure was to state explicitly that she rejected the concept of universalism. This was the real Scottish Labour Party here – not the one which pretends to sympathise with the squeezed middle classes or which tones down its socialist rhetoric. Being ‘progressive’ and ‘redistributive’ is what it wants to do and, if the Scottish and UK parties are indeed following the same course, then where Scotland goes first, the UK will follow. Yes Hamish, that’s how it works. 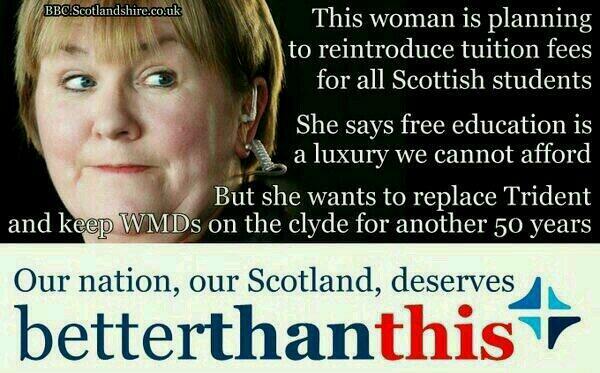 Where Johann Lamont leads, the UK party follow. She’s a hugely respected figure who is leading policy at a number of influential think tanks very close to the heart of Miliband’s inner core. Over at the Herald, Magnus Gardham spoke of ‘another sign of Labour’s shift to the left’. Meanwhile, back on Planet Reality today, Shadow Work and Pensions Secretary, Rachel Reeves explained that Labour would be backing Osborne’s pension reforms. It’s not exactly the Communist Manifesto, is it? As new research finds average debt of low income households affected by benefits changes is almost £3,000 – up 29% since October. As the cuts leave 250,000 people ‘without state care’ and further cuts are promised by the coaltion. This would be an opportunity for Labour to mark out an alternative. Not a some cunning tactic to win over a key demographic – but because that’s supposed to be the ******* point of the Labour Party. That there is no such response, whether from Johann Lamont (we think the scribes mistook tribal rage for radicalism) or from Ed Miliband and his hapless band of policy wonks, is sad but true. What Mr Miliband means by social justice when he and Mr Balls, armed with a “zero-based” spending review, are promising still more cuts is anyone’s guess. Labour’s short-term offer amounts to little more than a redistribution of the social and economic pain. Voters neither believe in him nor trust him. It is the central fact of British politics. It is also a large, inescapable fact in Scotland’s long argument over independence. There is no Labour escape route. All the talk of social justice one day is just talk. This week, today, tomorrow and the next, and in the weeks ahead, we will see the Labour Party’s new socialist credentials revealed. Despite desperate cheerleaders in the media, it will remain utterly committed to the Austerity Union. That’s guaranteed. Margaret Curran as Rosa Luxemburg: I love it! I wonder how OneNation Labour’s immigration and EU policy will shape up after the EU Parliament elections? Could be another visit to the UKIP focus groups to determine what these “international socialists” believe in. We have the Bond baddie, but another Rosa? Some of my disadvantaged countrymen are being treated worse than animals! If Dickens were alive today he’d have a fechin field day. This is how far the UK has sunk. Into a swamp of bile. The only difference between Labour and the Tories can be summed up in one word. Hypocrisy..
Hit the nail on the head, Ronald. Just managed to hear part of the teatime news, so while I know that all the S.N.P M Ps voted against the benefit cap, can anyone tell me how many Labour M.Ps from Scottish constituences voted, and more importantly, how they voted? Combine the voting decision of the MPs listed with the levels of child poverty in the constituencies they reign over, then the truly disgusting nature of their decision to support the Tory-Liberal government becomes unavoidably clear. Maybe this is the type of socialism they were gushing over at their conference last week – the type of socialism advocated by the likes of Nigel Garage. The question has to be asked why these journalists can’t see that which is patently obvious. I was at a RIC event in Aberdeen tonight. It was an excellent event, but what I find interesting is the double standards shown by many in the discussion, where there is a shared assumption that the SNP are a neo-liberal party in social democratic drag, as if there has been a real socialist alternative in this country against which they are being compared. When would that have been? 30 years ago, 40 years ago, 50 years ago? I see no double standards evident. It’s entirely possible for the Scottish National Party to be both neo-liberal economically, and centre-left on social affairs. Any social democratic party which combines socialists like Christina McKelvie and centre-right wingers like Fergus Ewing, could only realistically be described as such. Radical Independence – It’s radical. Does what it says on the tin: looks to the future, and acknowledges the past failures. Shall we look forward to the time when Radical Independence replace the busted flush that is the Labour Party in an Independent Scotland? I fully agree. I fully agree because that wasn’t my point reread my comment. My point was about the attitudes of those who feel a need to distance themselves from the SNP. They set a higher bar for the SNP than for Labour. There is still adherence to an idea that labour has just lost it’s way, that’s all, but, in comparison the SNP are seen as having always been composed of narrow nationalists with neo-liberal instincts who have merely adopted a façade of social democracy in order to win over West Central Scotland. It was present in some comments last night and is an undercurrent in a lot of political commentary in the MSM. I disagree with some SNP policy, but I don’t agree with that analysis because, as you say, the SNP is a genuine mix across the board and Labour have always been part of the British establishment from Ramsay MacDonald onwards, something that no one can accuse the SNP of, which, in my book, is a more important distinction, and makes the SNP more radical in its effects than Labour will ever be able to be. 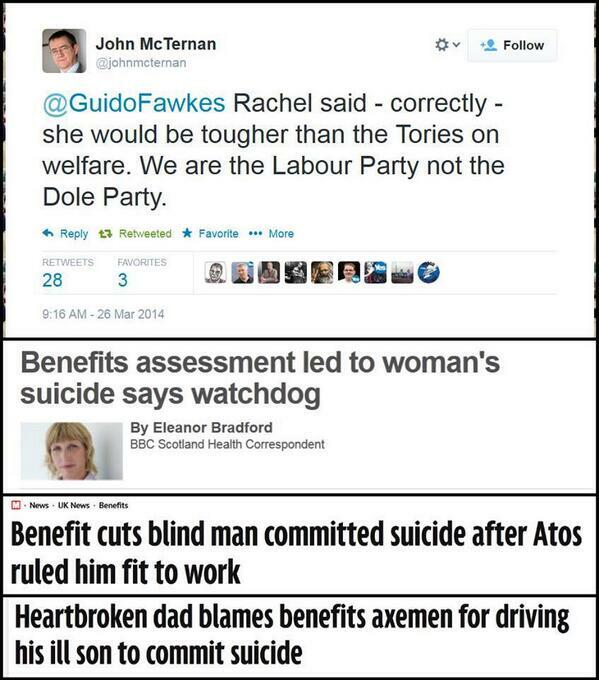 It’s reprehensible that John McTernan should be so fiercely supportive of benefit cuts. Apart from a couple of years at Scotland on Sunday, he’s spent his entire career working for political parties, at the expense of their supporters and the public purse – and with rather less profit to society, benefit to the public good and contribution to the sum of human happiness than if he’d been on the dole. I repeat what I said last week about Rosa Klebb’s speech. It was unadulterated waffle laced with poisonous hatred of the SNP. And lo and behold I have been proved right in only a few short days as Labour reverts to its new rent boy position for the Tories. If these welfare cuts kick in and a Mr Cameron Stooge and his wife Samantha have triplets around March after that year’s limit has been reached. Three autistic children called, George, Ed and Alexander I will feel really sorry for them. I’ve been wondering for the last few days while the is absolutely nothing…zip…nada,,,in the UK press about Labour voting with the Tories on the welfare cap. Why is that not a story? I think I get it now. The Tories wanted lots of press coverage about how Labour were the party for work shy scroungers (possibly black). So Labour voting with them on the welfare cap was a smart move to head off those headlines. Guess what? Job done. No headlines. That’s why they looked so please with themselves. But I didn’t get that because these days I’m a foreigner who lives in a country where what was a smart move in Westminster was a symbolic act of historic, mind blowing treachery. Which in Westminster really was a smart move. Which means we really live in a different country. Already. So the vote in September is not a vote for change, it’s a vote to recognise what has already become reality. We are not one country any more. The last of which may well prove to be decisive.